Light Commercial, Marine, Deep Cycle, Heavy Commercial and Standby batteries, offering a world-class range of products and brands. As an affiliate of the world renowned GS Yuasa corporation, one of the world’s leading battery manufacturers, the complete Yuasa Batteries range has been developed using some of the most advanced technical resources and manufacturing processes in the world. 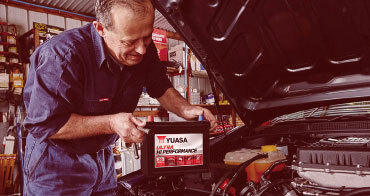 Yuasa batteries are backed by a fully comprehensive nationwide warranty and supported by one of Australia's most extensive sales and distribution networks. This gives you the reassurance that your Yuasa battery is protected against faulty materials and workmanship for up to 36 month’s*. *Conditions apply, refer to individual warranty statements affixed to each product.